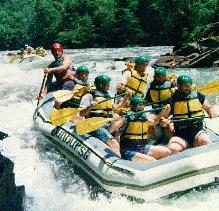 After speaking at an "Environmental Forum" conference in Chattanooga (I was invited to the conference by Tennessee trail advocates interested in my speaking about how to build a greenway) a Nashville friend takes me camping and whitewater rafting on the dreaded Ocoee River (possible site of a portion of the '94 Olympics). Part of the amusement of the rafting is that the woman sitting behind me falls out of the raft as we shoot through one of the rapids. The amusing part of it is this: (1) She was the one out of 50 of us who was chosen, before the trip, to help demonstrate what to do if you fell out of the raft; and (2) Five minutes before being dumped out, she had just agreed to my suggestion to change places in the raft (about mid-way along the trip) in order to find out what it was like in a different spot on the raft. Apparently, I moved just in time. She was a bit shaken, but otherwise unhurt after we pull her back in. That night, we visit a local dance bar with a gravel floor. Motto of the place: "Grovel in the Gravel at Grumpy's." The Ocoee is one of the premier rivers in the southeast and one of the most popular in the eastern U.S. River Runner magazine calls it one of the 10 best whitewater stretches in the U.S. The run is 4.5 miles long and features almost continuous whitewater during its 60-foot per mile drop. Many Class III-IV rapids, including Entrance, Broken Nose, Double Trouble, Tablesaw, Diamond Splitter, and Hell Hole. In operation since 1976 when water was returned to its original channel after a 1912 flume was deemed unsafe. The Tennessee Valley Authority regulates the flow to assure continuous rapids and dependable water levels.